Built in 1879, this elegant shopping arcade links 28 Old Bond Street with 12 Albemarle Street and houses several small and exclusive shops selling silverware, art, bespoke shoes and chocolate. 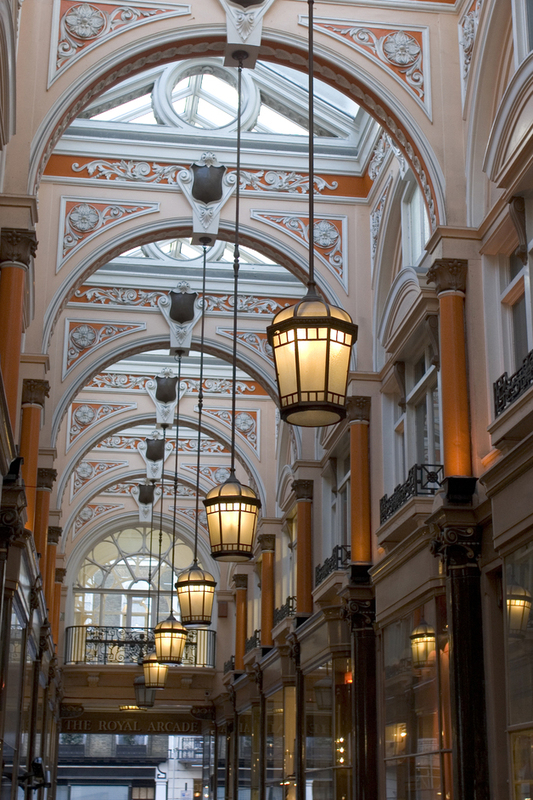 Originally called 'The Arcade', it was renamed as the 'Royal Arcade' after the shirtmaker H.W. Brettell was patronised by Queen Victoria. William Hodgson Brettell opened his shirtmakers at number 12 in the Arcade in 1880 (aged 24), it's now occupied by the Ormonde Jayne luxury perfume shop. What are the best dining options near Royal Arcade London? Royal Arcade gyms, sporting activities, health & beauty and fitness. The best pubs near London Royal Arcade. Royal Arcade clubs, bars, cabaret nights, casinos and interesting nightlife. Where to have your meeting, conference, exhibition, private dining or training course near Royal Arcade. From cheap budget accommodation to luxury 5 star suites see our special offers for Royal Arcade hotels, including Holiday Inn London Mayfair from 79% off.